​This power-packed serum contains an exclusive blend of ingredients specifically formulated to address the multiple causes of dark circles and under-eye puffiness. Feel a cooling sensation as the revitalizer begins to work within seconds of applying. There are multiple external and internal factors that can cause dark circles and under-eye puffiness, so these common beauty concerns are often difficult to treat. That’s what makes TimeWise® Targeted-Action® Eye Revitalizer so remarkable. This power-packed serum contains an exclusive blend of ingredients specifically formulated to address the multiple causes of dark circles and under-eye puffiness. After just two weeks, 7 out of 10 women* said their dark circles and under-eye puffiness were less noticeable. This product also is clinically tested for skin irritancy and allergy, suitable for sensitive skin, fragrance-free and non-comedogenic. Hold the bottle at an angle to deliver the serum to the rollerball. Place the rollerball at one corner of the eye and roll the applicator to the opposite corner and then back to the starting point. This will apply all the product you need. Gently pat into skin with your ring finger. Citrus Peel (Apigenen) is an antioxidant that helps reduce the appearance of dark circles. It also helps protect the skin and aides in maintaining the natural support barrier while reducing irritation caused by certain environmental elements. Cucumber Cucumis Sativa Extract is a soothing agent. Known for its calming and soothing properties. Oat Kernel (Avena Sativa) Extract is a soothing agent that has been shown to reduce irritation caused by certain environmental elements. Gotu Kola Centella Asiatica) is a conditioner and toning agent that helps protect the skin and aids in maintaining the natural support barrier. It also increases microcirculation to help keep excess fluid from settling under the eyes. Dark circles and under-eye puffiness may appear due to environmental exposure, UV damage, external irritants and excess melanin. 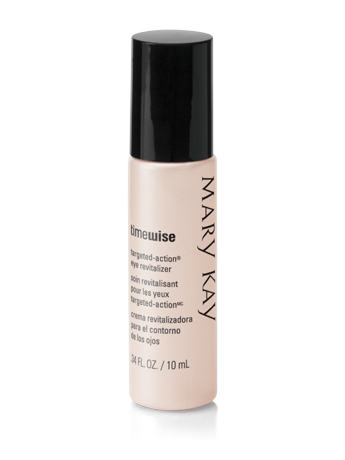 Mary Kay scientists determined the most effective ingredients to address the multiple causes of dark circles and under-eye puffiness. Many of these ingredients are botanically derived, and in combination with peptides and other non-botanical ingredients, are able to deliver the most impressive results.